Along the Smoky Mountains! Only 15 minutes away from downtown Gatlinburg is the breath-taking Rocky Top Lodge. Experience the perfect Smoky Mountain vacation rental with up to 14 guests. Inside there are tons of unique amenities such as a hot tub, pool table, air hockey, and more! The planked ceiling, walls and floors along with unique decor create the perfect “cabin vacation”. There is an open flow from the living room, kitchen and dining area. The large deck with the hot tub offers stunning views of the Smoky Mountains beyond the woodlands. 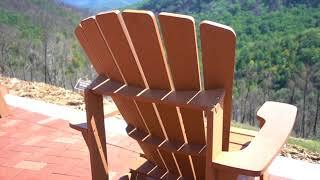 Relax in the hot tub or on the outdoor chairs and enjoy the mountain air. Whether you are vacationing with family and friends, on a corporate retreat, on a church retreat, or competing at the nearby Rocky Top Sports Word, The Rocky Top Lodge will provide you with an optimal location and unique amenities. There are a total of 6 bedrooms at the lodge: 1 bedroom with a king-sized bed, 4 bedrooms with a queen-sized bed, 1 bedroom with the twin over queen bunk bed. The stone surrounded fireplace adds warmth and charm to the lodge. Along with the pool table, air hockey table, and TV in the game room, there’s also a table for playing cards and board games. Rocky Top Lodge is part of the Garitlinburg Chalet Village community which means that guests have free access to 3 swimming pools in the summer along with ping-pong, foosball, and tennis courts. The unique location of this property allows guests to easily explore the Smoky Mountains with 800 miles of hiking trails. 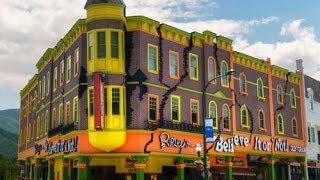 Gatlinburg is home to Ripley’s Aquarium of the Smokies, the Guinness World Records Adventure, restaurants, breweries, distilleries, thrill rides, skiing, live shows and more. A little less than a half-hour away is Pigeon Forge. In Pigeon Forge be sure to check out Dollywood, the Titanic Museum, Parrot Mountain and Gardens, and dinner theaters. Gatlinburg provides endless amounts of family attractions, including Ripley’s Super Funzone, mini golfing, mountain gliders, horseback riding, sky lifts, Ripley’s Penguin Playhouse, museums and more! This is truly an outdoorsman’s paradise! Enjoy the flora and fauna while hiking the Great Smoky Mountains. This area provides some of the finest fly fishing in TN. If you are a thrill seeker, try whitewater rafting or zip lining. During the winter Ober Gatlinburg Ski Resort has a variety of ski slopes, tubing hills and a massive indoor ice arena. Come visit any time of the year! *** All fees will be provided prior to booking.